The Wesleyan Covenant Association is honored to announce that Bishop Mike Lowry will open its Third Global Gathering at Mt. Bethel United Methodist Church in Marietta, Georgia on Saturday, November 3, 2018. During its opening worship service, Lowry will preach a sermon setting the tone for the Gathering’s “Unashamed!” theme. The event is expected to attract thousands of United Methodists across the connection. 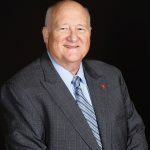 The resident bishop of the Central Texas Conference of The United Methodist Church / Fort Worth Episcopal Area, Lowry is the spiritual leader for approximately 154,000 United Methodists in as many as 320 congregations and developing faith communities. Before his election and consecration as bishop in July 2008, Lowry had effectively served small, mid and large churches in central and south Texas. Just prior to his election to the episcopacy he served as the executive director of New Church Development and Transformation in the Southwest Texas Conference in San Antonio, Texas (now a part of the Rio Texas Conference). A 1972 graduate of Earlham College in Richmond, Indiana, Lowry earned his Master of Theology from Perkins (at SMU) and his Doctor of Ministry from Austin Presbyterian Theological Seminary. He is a regular blogger at his post, “This Focused Center.” His publications include: “Generous Living” sermon, Best Stewardship Sermons of 2005; contributor to Abingdon Preaching Annual 2003 -2011; “Order,” Finding Our Way: Love and Law in the United Methodist Church ; “Engage For Such a Time as This,” Missio Dei and the United States: Towards a Faithful United Methodist Witness (The General Board of Higher Education and Ministry, The United Methodist Church). He has been awarded the B’nai B’rith Award in Social Ethics by Perkins School of Theology and the Harry Denman Evangelism Award by the Foundation for Evangelism (2015). He and his wife Jolynn are the parents Nathan and Sarah. Nathan is married to Abigail, and Sarah to Steven. Bishop Lowry and his wife take great joy in their four grandchildren: Adam, Grace, Simon and Sam. Family time over the years has included trekking in the country’s national parks. The WCA counts it a great privilege to have Bishops Lowry open its Third Global Gathering. To join thousands of others, click HERE to register at the host site or a simulcast site near you.